Not exactly your fluffy hair metal from days gone by.. that for sure. Gone are the big hairstyles, the typical eighties heavy rocker attire as we saw with the band Winger – in stark contrast to the cut-back trimmings of Kip solo material. Thoughtful melodic rock, deep, atmospheric, stylish, and (for want of a better word) cool. There are not too many examples or comparisons I can leave you – but an investigation into this album would be like reading a 500-600 page ‘hard to put down’ book. You have to dig deep and listen carefully to the well crafted slices of rock evident on this album. With some help from melodic rock luminaries Danger Danger Andy Timmons, fellow Winger band mate Rod Morgenstein, and Giant Alan Pasqua, this long winded named album (won’t repeat it here.. you can see it named above), certainly has class stamped on it. What you won’t get here is music resembling those aforementioned bands. This is Kip album – and his ideas and songs come to the fore. ‘Kiss Of Life’ is Kip prelude – funky, cool, and streamlined, and urban. ‘Monster’ is another to follow the path of ‘Kiss..’ though the chorus has a dramatic build to the point of climatic.. ‘now my monster is on to you..’ ‘Endless Circles’ is seriously good, opening up with a delicate piano line from Pasqua, following on with some emotion soaked singing and playing, sort of like a cross between Toto and Steve Perry (circa ‘For The Love Of Strange Medicine’). ‘Angel Of The Underground’ starts off with an ‘after dark intro, followed by some energetic acoustic guitar. ‘Naked Son’ is as poignant as the title suggests, echoing a call to the spirit.. ‘kundalini rise up from the dead..’ ‘How Far Will We Go’ is a majestic piece.. play this one loud, and it really gets into your ear. The album ends with a backwash of ambient keyboard effects on the track ‘Here’.. before sliding off into the sunset..
Kip career has surged forward, particularly after the cheap-shot jibes thrown at his band via that callous and cruel Beavis And Butthead nonsense – with further albums being released after this one. Despite the legacy of a pretty boy rock band image with Winger, and the reputation for being nothing more than a Bon Jovi clone, Kip proves beyond all doubt that there more to the serious pouting, and that indeed.. talent runs deep. And ‘deep’ is a word that quite appropriate with this album. Here what you need to do…put this CD in and don’t tell anyone who it is. I guarantee, they’ll be completely into it! I’ve been a fan of Winger for years and always thought they were unfairly branded as a “”shallow hair band.”” This release will prove the talent that Kip has always had. That said, you should also know that this is not your typical Winger fare. This is a melodic journey that will take you to places you would never expect. Even as I fan, I was stunned at the emotional depth and talent on this CD. It has a progressive rock feel that will blow your mind. 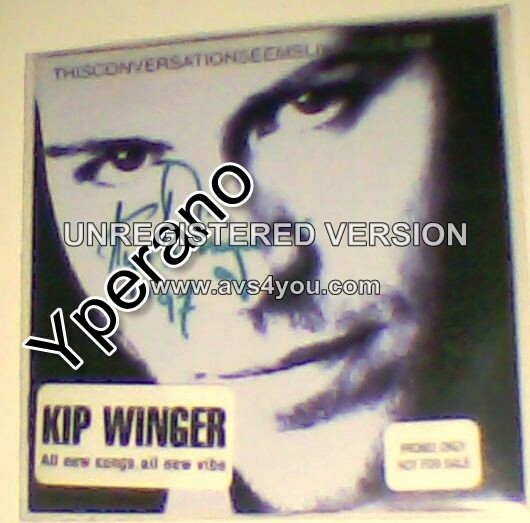 I’ve told people recently about this newer stuff…they all laugh, “”Kip Winger? You’ve got to be kidding me.”” Then they’ll come by my office later wondering what that awesome music I’m playing is…when I tell them, they become converts. Trust me, I work for a major broadcasting network…I know good music… and this is definitely it. I’ve known all along that, given a chance, Kip Winger would come out of this ‘heavy metal’ classification and could do something like this. I’m overall very pleased with this album. I find it hard to believe that Kip Winger will ever make a better CD than this. Kip Winger continued to mature with his audience, and I thoroughly enjoyed this CD. If you want classy and intelligent music then do yourself a favor and buy this CD. Seriously, can you find a better combination of incredible vocals and intelligence coupled with musical vision in one guy? Sting comes close, certainly an equal compositionally, but he doesn’t have Kip tone or range. Sting also is largely unconstrained financially, so Kip has to do more with less backing. This fact alone contributes to the weird-factor of many of Sting efforts…he can do whatever the hell he wants (it not like Sting didn’t write cheesy commercial stuff at times with The Police). Winger as a band made some fun riff-rock, but was easily categorized, and then musically castrated for no apparent reason around 1991. What else was a band of musicians to do in 1987? They wrote to the record-buying public so they wouldn’t have to wait tables all their lives. So what the fekk is wrong with that? If you were a musician and had busted your tail working your craft for more than 10 years, would you rather make a product that will sell or become an engineer, thus haulting all work on your art for many years (think Tom Schulz) to be a non-musician, at best, or far, far worse. I see Kip for what he is, a guy who truly loved to write and record, and who did whatever he could to make that happen…and thank god for it. This album shows this, and also proves that corporate music is on its way out the damn door, as it should be. First things first. This is not the typical Kip Winger album. There are some things to know that will change your mind either way. You had to have liked Kip voice before to enjoy this album, however his scratchiness has been toned down to a cleaner, more melodic version. Next, well the sound is much more VH-1, but the songwriting is much more mature. There are pianos, flutes, & lots of acoustic guitars on this one. That should be more appealing to those of you who enjoy Tonic. It could also entice the ear of those who enjoy Sarah, Jewel, & other coffee house sounds. The songs are diverse, intense, hook laden, & emotional. The musicianship is top quality. Every ounce of care was taken to let all the players shine, while not allowing any big 80 egos to ruin a good thing. I believe this to be the best Kip Winger album so far, but it is for those who appreciate a more mature sound. Bright spots are “”endless circles””, “”kiss of life””, and “”don’t let go””. I’ve been a Winger fan for years, and still enjoy their music however Kip ‘deeper direction’ in his approach to songwriting as opposed to ‘chunking’ is so evident here. This cd is an import in Canada, (too bad!!). This cd proves that he endured the ‘glam’ era only to come out stronger than ever in what I think is his best material yet……personal fav? Endless Circles, Naked Son, Kiss of life, Angel of the underground….really…this entire CD is worth checking out….. (ps) Great musicianship, Rod Morgenstein drumming is bang on for this style of music!.. 5.0 out of 5 stars The BEST work to date by Kip Winger! Wow, where do I begin? I have always been a fan of Winger (and Kip Winger), since they were one of the more talented bands that got grouped together in the whole “”hair band”” genre of music. That wasn’t a bad thing, because they made great, fun music, but they never received their due credit. Once I heard about Kip Winger releasing his solo work, I was curious which direction it was going to go. Needless to say, I was blown away! Finally, Kip Winger was able to demonstrate that there is an amazing song writing ability that people never saw in Winger from their pop anthems. There are some amazing songs on this CD, which if they ever played on the radio, would go over extremely well, but that the story for so many underrated artists. The best song (in my opinion) on this CD is definitely “”Naked Son””. The depth of the lyrics and the quality of the music is beyond me to describe, but that is far from the only highlight on the album! With other songs like “”Kiss Of Life””, “”Daniel””, and “”How Far Will We Go?”” (ANOTHER amazing song), the album is far from being good for just “”a song or two””. Like me, if you thought Winger was a much more talented band than they got credit for (especially Kip Winger), you definitely want to check this album out. It is definitely the best solo album from any lead singer of the EXCESS of 80 rock/ Glam bands. Give the clips a listen on here, and you will definitely realize what a tremendous album this was from Kip Winger (the first of TWO great works, with “”Songs From The Ocean Floor”” the other, by him). Definitely check the album out. Away from the lights and the glitz and the Glam of MTV and arenas, Kip Winger did some of the best song writing in a long while. 5.0 out of 5 stars Absolutely fantastic! Steam – What a fantastically magnetic guitar riff! Here – What absolute devotion! I could probably list every song and say something wonderful about all of them. The disc hasn’t left my CD player since I bought it. I love it! The emotional breadth of Kip Winger “”Thisconversationseemslikeadream”” is simply breathtaking. His music has really matured and gone far beyond the narrow scope of heavy metal. Winger is an excellent songwriter and has a great voice. He so cool. Just really the best. Forget Lennon, forget McCartney. This is lyrical content at its best. If you don’t feel emotionally drained after listening to this CD then you must be a robot! How this did not win a Grammy is beyond me. I just can’t understand it. In fact, I think this CD was largely overlooked by the public in general. Maybe they are more tuned into other Winger anthems such as “”17″” and the classic “”Heading for a Heartbreak”” which I think should rival Stairway to Heaven as one of the best rock songs of all time. I hope Winger comes out with another album soon. Its gauranteed to be as good as anything the Beatles or Led Zeppelin ever did. This CD belongs in everyone home. It may be overlooked now but history will show Thisconversationseemslikeadream to be the best rock and roll album ever cut! 5.0 out of 5 stars What Is Success Anyway? If you’re a Winger fan, and you probably are listening to samples, then this is so vastly different than the classic Winger sound which was definitive from the get-go. If you play this CD for almost anyone they will NEVER connect that this is the lead singer from that rock band Winger. How does one really measure success? This CD is as good as anything on the market-period! The entire history of Winger is convoluted with image and non-sense that make the name, sell the tickets, but is all of that “”stuff”” really real? With Winger, it was real, both the image and the music. These guys could PLAY! PULL is an amazing CD. Kip is really an artist. Songs like, “”Don’t Let Go”” & “”Here”” just emphasize the guy immense talent. The other band that comes to mind with this same image issue is TOTO-the most diverse band anywhere. If you haven’t heard, Kingdom of Desire or Mindfields (with original lead vocalist Bobby Kimball) than get them…NOW!